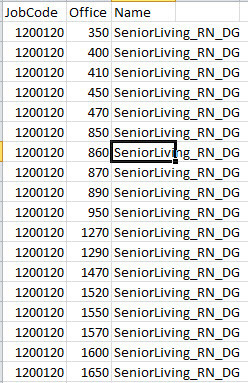 I have a CSV file that has a repeated job code number and various office location numbers. I am wanting to create a dynamic distribution list with this information. I have included a screenshot below. I would like there to be parameters that would ask questions such as ListName, Alias and then have it use the imported CSV file as the RecipientFilter criteria. Is this able to be done? Yes, all that is doable. Did you try anything or are you expecting any ready made script ? If you have given it a try, post the script with the error/difficulty you are facing, else please give it a try. Thanks for the reply kvprasoon. The code fails and does not generate a Dynamic Group. Well, here are some comments. You have CenterNumber picked from CSV and assigned to $center variable but, 'CenterNumber' is what you have used for filtering. The topic ‘Creating a dynamic distribution list using an imported CSV file’ is closed to new replies.